The average weekly rate for a 30-year fixed-rate mortgage jumped to a two-year high, Freddie Mac said on Thursday. 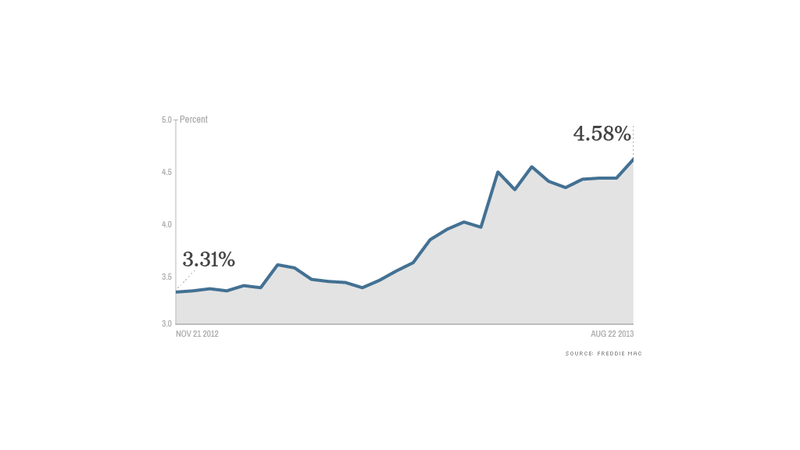 The rate is now 4.58%, up from 4.4% the prior week. That is the highest level for the 30-year in more than two years, since it hit 4.6% on July 7, 2011, according to Freddie Mac spokesman Chad Wandler. Wandler attributed the increase to an improving housing market. He also cited investor concerns about when the Federal Reserve will taper its government bond-buying program, which could affect interest rates. Rising rates could also affect the housing market going forward. A recent survey by real estate company Trulia found that an increase in mortgage rates was the prime concerns among 41% consumers, who worried about that more than price increases. Home prices have also been rising. According to the most recent figures available, the S&P/Case-Shiller home price index was up 12.2% in May compared to a year ago. That was the biggest such jump since March 2006, close to the peak of the real estate bubble. The recent increase in housing prices has also given rise to concerns of a new housing bubble. But Keith Gumbinger, vice president of the mortgage information web site HSH.com, dismissed those concerns. "I think it's too early to declare that we're in a housing bubble yet," he said. "We remain well below the peaks of just a few years ago." He said the housing market is "recovering, and recovering well" but added that mortgage rates of nearly 5% are still historically low. Correction: In an earlier version of this article, the chart contained the wrong data for the 2012 interest rate.